In the thirty-one years since Harold Washington died at his City Hall desk, there have been two elected mayors of Chicago, both white. The first was Richard M. Daley, purveyor of privatized parking meter deals and failed Olympic bids, and heir to the Daley political dynasty. He was succeeded in 2011 by Rahm Emanuel, once—to quote a childhood acquaintance—a “hyper-intelligent [bully]” on the North Shore, now a neoliberal cheerleader governing primarily for the benefit of the city’s financial class. Neither faced a serious electoral challenge until 2015, when Jesus “Chuy” García (once a Washington disciple himself) forced Emanuel into a run-off, though even the result there wasn’t particularly close. Chicago’s political leadership, then, has closely mirrored the city’s own transformation from inequality-ridden Machine den to inequality-ridden global metropolis. In that context, the Washington mayoralty often scans like a blip of progressivism in a death march fueled by police violence and eternal pension-payment deferrals. In light of this, it can feel a little odd to go back and read excerpts from Washington’s first victory speech, in which he told a crowd gathered at a former South Loop printing plant, “A great adventure has begun right here. I am proud to be a part of that great adventure. I am so humbled by the fact that you have seen fit to give me the responsibility to lead that adventure.” Words like these spark intense curiosity about the city’s different possible presents. What might Chicago look like now if, as Washington himself often joked would happen, he had been mayor for twenty years? A new book by Roger Biles, a professor emeritus of history at Illinois State University, doesn’t directly answer this question, but it does give us the tools to do so, providing one of the most comprehensive overviews to date of Washington’s politics and policies while in office. 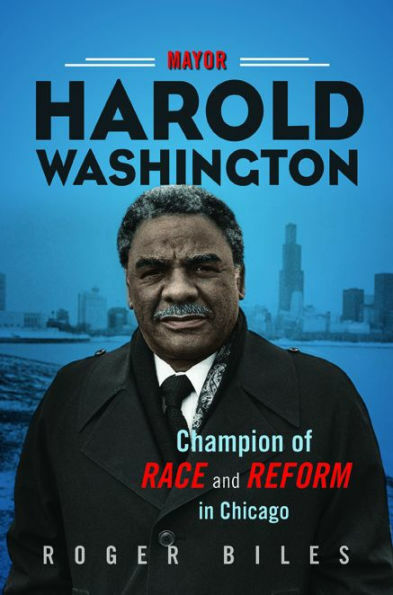 In Mayor Harold Washington: Champion of Race and Reform in Chicago, Biles’ argument slots into the two categories listed in the subtitle: he suggests, first, that Washington was a more effective progressive than historians and journalists have given him credit for, and second, that this progressivism both originated from and fought against the city’s deep-seated racial inequality. The release of Biles’s book also coincides neatly with the republication last year of Dempsey Travis’s intimate 1989 biography of Washington. Travis, who died in 2009, was a real estate developer most famous for writing An Autobiography of Black Chicago, and an early supporter of Washington’s political career. While Washington was mayor, Travis conducted a series of interviews with him; the first one took place six days before his first inauguration, the last one about a year before his death. These form the cornerstone of the book, which was written and released in the wake of Washington’s death. One biography is an impassioned first-person account that highlights Washington’s symbolic importance as the city’s first Black mayor; the other, drier, focuses mainly on policy. Together, they paint a thorough portrait of Washington’s personality and political career, particularly his tenure as mayor. They encourage us to think about his relevance to the city’s political landscape today, and leave room for us to wonder—what might have happened to a city that continued along on his great, singular adventure? Washington came to politics through his family. His father Roy was a lawyer, minister, and former Stockyards packinghouse worker, as well as a long-standing Democratic precinct captain in Bronzeville. Recounting visits from revered Black politicians like William L. Dawson and Oscar DePriest, Washington told Travis,“the only subject that superseded politics in our home was religion.” Biles describes Roy himself as “unswervingly loyal to the Democratic organization,” even after the party passed him over for an aldermanic post. It’s a little puzzling, then, that Washington himself seems to have been independent-minded from the outset. He quit an early job in the corporation counsel’s office under the first Mayor Daley, where he was reportedly being groomed for city prosecutor. As he put it, “I couldn’t get along with the racist mothers”—the other attorneys in the office who were envious of his quick promotions. In 1976, Washington was elected to the state Senate as a self-described “organization liberal,” though Daley, exasperated by his contrarianism, initially refused to lend him party support for the post. Four years later, he was elected to the U.S. House of Representatives, this time with an explicitly anti-Machine message. In between the two victories, he had made an unsuccessful run for mayor after the elder Daley’s death, losing the 1977 Democratic primary to Michael Bilandic. It was after this defeat that he made his final and irreparable break with the Chicago Machine, dramatically hijacking a press conference and excoriating Bilandic as a “third-rate boss Daley.” After winning re-election to the House in 1982, Washington’s supporters encouraged him to run for mayor against Jane Byrne, who had defeated Bilandic in 1979. He was hesitant, but eventually relented after his supporters registered 125,000 new Black voters, well over the 50,000 Washington had set as a condition of his running. Of course, the new mayor also had to contend with an absurdly hostile City Council. It’s common knowledge by now that the first years of Washington’s administration were spent mired in the Council Wars, the name given to the rancorous legislative gridlock that resulted when a group of twenty-nine aldermen—a majority of City Council, led by white South Side aldermen Eddie Vrdolyak (10th) and Ed Burke (14th)—decided to oppose any reforms, and pretty much any legislation, proposed by the new mayor. During the council’s first meeting after Washington’s inauguration, Vrdolyak called a quorum with only the twenty-eight other aldermen on his side present, and awarded them the juiciest committee assignments and chairmanships. (Burke was made chairman of the powerful Finance Committee; apart from a three-year gap in the late 1980s, he’s held the position to this day.) Relations only deteriorated from there, with acts of warfare running the gamut from serious—annual, months-long battles over the budget and neighborhood bond funding—to farcical: after Vrdolyak held a scolding press conference in front of a downtown lot ridden with garbage, it emerged that city workers, presumably under Vrdolyak’s direction, had dumped the trash there a few hours before his arrival. Despite this, Washington’s first term saw some reforms, including the city’s first freedom of information law, the institution of affirmative action in city hiring, the signing of the Shakman decrees that effectively ended the patronage system, and increased federal funding put toward neighborhood development. This last was a key portion of Washington’s economic plan to move city planning away from the core-first model of previous mayoral administrations in favor of a more equitable form of investment across the city. Biles is generally vague on the tangible results of this philosophical shift, though. How did neighborhood development actually improve during the Washington administration? In his retelling, it often seems tied to the administration’s efforts to retain manufacturing jobs, which led to the creation of Planned Manufacturing Districts, zoning tools that prohibit residential housing in industrial areas. But this seems slightly different, and the fate of the funds from the more relevant tool Washington used—the federal bonds explicitly earmarked for neighborhoods—remains a bit of a mystery. Still, these were perhaps the sort of small compromises necessary to govern in a city where racial tensions were still more or less out in the open. Vrdolyak himself openly played off of racist sentiment: during the 1983 primary, he spoke to a group of Northwest Side precinct workers, telling them, “It’s a racial thing. Don’t kid yourself. I am calling on you to save your city, to save your precinct. We are fighting to keep the city the way it is.” And Travis’s first-hand accounts are damning. “On the day after Harold’s primary victory,” he writes, “several white folks turned their heads or looked over or through me as our paths crossed. You could see panic on the faces of many of those who were bold enough to make eye contact.” Biles suggests, not completely convincingly, that the Vrdolyak 29 (all but one of the aldermen in the coalition were white) were primarily motivated not by race but by a desire to preserve the city’s traditional patronage system. Whether or not this was the case—their support for openly racist Republican Bernard Epton in the 1983 general election doesn’t exactly count in their favor—plenty of their constituents were certainly motivated by racist anxiety. Race also played a major role in the redistricting lawsuit that led to the defeat of the Vrdolyak 29. In 1982, a group of organizations had sued the city after the previous year’s district remapping, alleging that it unfairly diluted Black and Latinx voting strength. After a prolonged court battle, a district court ordered that special elections be held in seven wards. When Washington-allied candidates—including Chuy Garcia and Luis Gutiérrez—won four of those elections, control of City Council flipped to the mayor. And in April 1987, Washington won re-election to a second term. It seemed that he might finally have the ability to enact a truly sweeping progressive agenda. Washington died half a year after his re-election. In the following succession battle, Vrdolyak and his allies engineered a victory for Eugene Sawyer—“reticent [and] unimposing,” in Biles’s words—over Timothy Evans, one of Washington’s close supporters and now Cook County Circuit Court’s chief judge. After Sawyer’s uneventful interim term as mayor, Richard M. Daley won the first of his six elections in 1989. As Biles tells it, Daley and Emanuel largely reversed many of Washington’s changes. The direction of development largely shifted back toward downtown, aided by murky Tax Increment Financing maneuvers. The more transparent, inclusive budget process Washington had begun ended abruptly, as Daley “became impatient with political opposition and ruled autocratically.” Emanuel closed mental health clinics and neighborhood schools, both without any real input from local communities. Meanwhile, Chicago’s citizenry is left to wonder what might have been. And though we can’t really know how Chicago would look today had Washington lived, Biles’s book does perhaps help us with a closely related question: in the upcoming mayoral election, what does a progressive alternative look like for anyone who finds Emanuel a dissatisfying choice? But it’s not always clear where this putative progressivism comes from. While it’s true that Lightfoot clashed with Emanuel while she was his appointed head of the Police Board and Police Accountability Task Force, she also faced strong criticism from radical and leftist activists for not being responsive to the families of those killed by police. And she disagrees with many of those same activists over the planned $95 million police academy in West Garfield Park, lending it her conditional support. LaRaviere has also criticized her for buying into “Republican talking points” because of her emphasis on not raising taxes, particularly for middle- and low-income families, as the city faces a looming pension crisis. The fact that Lightfoot has quickly been cast in the role of left-leaning savior from the evil Emanuel administration, despite her mixed record, shows how easy it can be to co-opt the symbolism and rhetoric of progressivism without necessarily adhering to its substance. (Her campaign also tried to hitch itself to progressive Alexandria Ocasio-Cortez’s recent Congressional win in New York City, pitching Lightfoot as following in her steps to a ThinkProgress reporter—but in an interview, she declined to endorse many of Ocasio-Cortez’s positions, including abolishing ICE and advocating for a single-payer health care system.) LaRaviere, for all his criticism of Lightfoot, hasn’t really articulated his own position on pensions beyond advocating for their “safeguarding.” Or, for a more absurd example, see Garry McCarthy—the police superintendent fired for his involvement in the aftermath of the Laquan McDonald shooting—and his comments about instituting “progressive needs-based spending” in neighborhoods. Washington certainly became a symbol—at his funeral, mourners packed the procession route for seventy blocks, and Barack Obama has cited him as the reason he moved to Chicago in 1985. But as Biles’s book demonstrates, he also had a concrete, substantive set of policies he attempted to enact, sometimes successfully, in the face of implacable opposition and coded racism. The worry today is that there are plenty of people eager to embrace the former, without paying any particular attention to the latter. Christian Belanger is a senior editor at the Weekly. He last wrote for the Weekly in May about about organizing around manganese pollution on the Southeast Side.